Budget For Your Needs - and Wants!! Say the word 'budget', and people tend to get a little unnerved. Budgeting brings up images of having no cash in your pocket - not being able to do anything fun - and living a life of TV and Ramen noodles. Done properly - nothing could be further from the truth. Setting yourself up on a budget is nothing more than telling your money where it is going. Want money in your pocket - put it in the budget. Want one night out a week - plan for it in your budget. It's just a matter of planning out exactly where you're going to spend your dough - and balancing the income with the out-go. There are a number of different ways to do your budgeting and there are lots of resources online to help you put your budget on paper. The first thing you have to do is track your spending for a month to see where your money is going now. Keep every receipt and track every dollar you spend. At the end of the month write it all out and seperate every expenditure into the categories you want to set up in your budget. Most of the time it will be a real eye opener when you see how much you're spending on things like take-out food and those morning coffees. The main thing is you have to know where your money is going - or where it went. Otherwise, how will you figure out if you're going to have enough money at the end of the month, instead of too much month at the end of the money. Once you've figured out how you spend your money, the next step is to set up your budget to stay within your available cash limit. Your income and your expenses must always offset each other. That includes extras such as savings, charitable giving if you think that's important as a student, and every penny that leaves your pocket or bank account. But as I mentioned earlier, budget in the extras like one night out per week if you want - as long as you are able to balance the numbers when all is said and done. 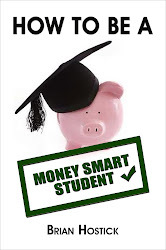 There is lots more to the whole process (and they will be the subjects of future posts) but basically make a budget - stick with it - give it a chance - It will help you on the road to being a Money Smart Student!! Today's tip is to follow the link below and read the article from CNN Money. It has the top Apps to help you save money and manage your money - everything from finding an ATM to tracking your receipts. If a few of them help you to handle your money better - it will be worth the time reading it. Enjoy! As some students prepare for Spring Break, March Break, whatever you call it where your are - here's a thought regarding this time of year. Using your student loan money to finance a wild trip to Florida or Mexico may seem like a good idea now - but the long term pain from the short term gain will haunt you for a lot longer. In fact, by the time you finish paying off the extra money you used to take the trip, you probably won't even remember some of the details of the vacation. Better to save that money and pay it back at year's end towards your student loan . Any amount you can take off your student loans before you are scheduled to start repaying is a bonus towards getting out of debt early. Enjoy your break - if you can afford it from work income or saved funds, then take that trip! But don't set yourself back even more financially by using borrowed money for a week in the sun. Give Your Time - Save Your Money! In honor of Special Education Week - and the people who provide a much appreciated service inthat field - today's posting is about giving of your time in order to save money. Many times the only reason we end up spending money is because we are bored with doing nothing and want to go out and 'do something'. Most of the time that 'something' involves spending money in one way or another. How about getting involved with a charity, or cause, of your choice instead. The time you spend volunteering somewhere there is a need, or taking part in an event to help raise money for charity, is time you won't be 'out' spending money. Not only will you be saving your money, the rewards you receive will come back to you many times over. Many people believe that in order to receive, you have to give first. The biggest reward, of course, is the knowledge that you helped make another person's day birhgter, or life a little easier. Also, how many times have you heard the stories of people who volunteered their time somewhere and ended up meeting someone there who ended up becoming their spouse - or their boss - or a benefactor in some manner. You never know who you'll meet and how your life will be enriched when you take some time to give to those in need. Today's tip is a follow-up to yesterday's printing item. I found the article I remembered which talked about the cost of printer ink. You can find it here - http://bit.ly/dEnBcC - and it is a very interesting read. What it boils down to is that some printers will warn you well in advance that you are running low on printer ink. The testers at PC World found out as much as 45% of the ink was still in the cartridge when the warning was given. Now, if you have a printer which shuts down when it's 'low on ink' that's a lot of wasted liquid. With the price of ink working out to $4,731 per gallon - that's a lot of money being left in the tank as well. The best remedy would be to research your printer before you buy to make sure you are getting one that won't shut down at the 'low ink' level. Make sure you purchase good quality ink cartridges for your color ink - but black ink seems to be a different matter. The quality difference is not very visible for most applications. Go with a generic black ink cartridge and maybe switch it out with a name brand one when printing important essays or assignments. TOTD - Isn't Technology Wonderful?!? Today's tip is an easy one but it's one that I remembered the hard way this past weekend trying to help my son with a project he was working on himself. This tip is especially relevant to students who need to work on thesis papers or longer essays as part of their course of study. I promise it is as close as I will ever get to a "Use one Q-Tip to clean both ears" kind of posting. To save on paper and computer printer ink, only print out the final copy of any assignments you are working on in your computer. Make any edits before printing it out. I know it sounds pretty obvious but how many times have you printed out the same assignment two or three times after making only minor changes to the computerized version? I'm going to try and find the source but I think I remember reading somewhere that printer ink is one of the most expensive liquids we can buy by volume. Something like it would take thousands of dollars to fill your car's gas tank if you filled it with printer ink!! I'll find that story and post it here as soon as I can. So it might seem obvious, but the savings will eventually add up if you only print out the copy you are going to hand in to your prof.
Straight and simple today - back to more thoughtful tips tomorrow. Today let's talk a bit about spending your entertainment dollars wisely. If you've done a good job budgetting your money you should still be able to have a little entertainment in your life. Movies, nights out with friends, nights in with friends - there are lots of things to do as a group or a couple - even on a budget. One good rule to live by though is not to spend your entertainment dollars somewhere where spending money is the main activity. This would include places like a Casino or a racetrack. If you've worked hard to save up those extra dollars in order to have a bit of fun - why waste the money on games of chance or on the horses?! There are tons of ways to have fun with your friends or significant other without breaking the bank and taking a chance of going overboard in the process. Budget entertainment right into your monthly plan - and spend those dollars wisely because you've earned it! Today's tip stays with yesterday's theme of banking. Try to find a bank or credit union which has ATM's, or a branch, on-campus or very nearby. When you need to take out money only use your 'home' bank's ATM. You'll be saving upwards of $2.00 per transaction you could be charged for using a different bank's ATM. Also - avoid those generic ATM's at the corner stores at all costs. Their transaction fees could range anywhere from $1.50 to $3.00 or more. Finally - you can also save extra transaction fees by using the cashback feature when making purchases at places such as Walmart which offer this service. If you think ahead and plan it out - you can avoid paying extra fees when it comes to taking your own money out of your own account. As things start to gear up here at Money Smart Students, I'm happy to launch the first entry in our new 'Tip of the Day' feature. Every day - Monday through Friday - I'll be posting a tip which will help you either save money or make money as a student. I've seen lots of lists out there giving what I would consider to be absolutely useless tips ('Only use one Q-Tip to clean both ears - use one end per ear!' - give me a break). I do not intend to do the same thing. Today's tip is this - Make sure you have the best account for your needs at your financial institution. Most large banks and credit unions offer student accounts with either no fees or very small fees - other than ATM charges. Make sure you have the right account type to qualify for the 'no fee' feature. If you aren't in the right account - ask at the counter the next time you're in the branch. All they can say is you don't qualify or they don't have one. You could save yourself upwards of a couple hundred dollars in fees over the course of the year. Multiply that by 3 or 4 years at school and it adds up.